Following the release of the adidas WMNS boots, the 3 Stripes are ready with a brand new pack, containing the X, Nemeziz and Predator in awesome camo colourways. Check 'em out! He doesn’t need an entourage, a team or an assist. He’s the Lone Hunter. He dominates every cage, in every hood, from sunrise to sunset, marking his territory single handily. Over step the mark and there will be hell to pay. Like the Skystalker Pack, the adidas Lone Hunter colours are inspired by the actions of the Nature’s predator, predominantly their environments, and how they establish their territorial dominance. The pack is built on revisited camo with a pop of orange. Tech-wise, the boots are identical to the Skystalker Pack, meaning the Lone Hunter boots "only" give us some new colour updates. But if you take a closer look at the designs, the colourways are really unique and you will without doubt have a hard time going unnoticed on the pitch in these ones. 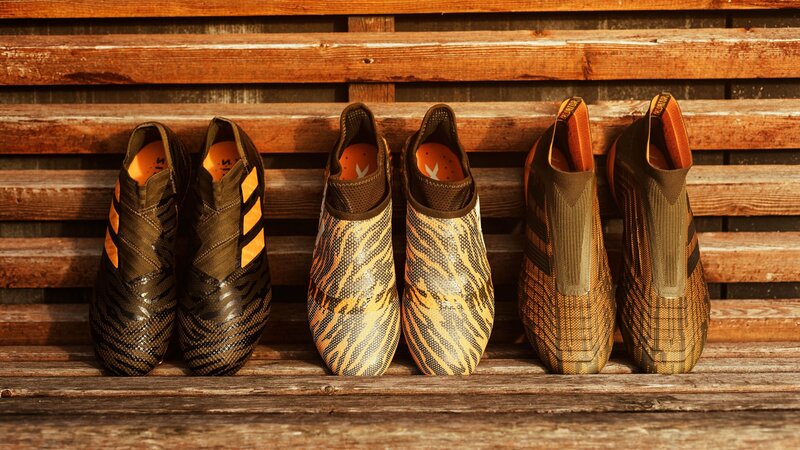 The camo look is reccuring in both the X, Nemeziz and Predator, and especially the X really gets your thoughts on one of Nature's most dangerous and beautiful predators, the tiger. Release your inner tiger and start your hunt for goals with the new Lone Hunter boots. Get your pair right here.